I do not know the Latin names of many flowers and herbs, but I know that the Latin name for my rose scented geranium is pelargonium. I love the way it sounds, and I love my scented geraniums. I first started using scented geraniums for aromatherapy and I am so glad they can be used for cooking. 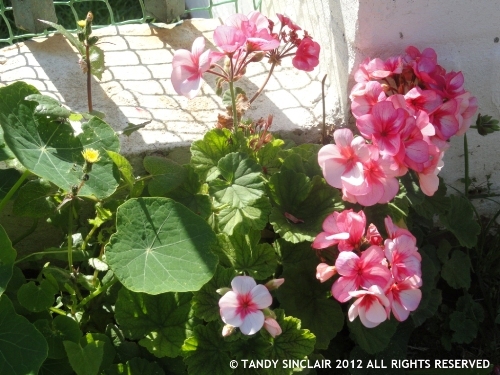 The species used to create the scented geraniums are indigenous to the Western Cape. They are soft to semi-hard wooded shrubs or subshrubs with a very wide range of leaf shapes. What you see here is a multi-stemmed small shrub which grows up to 90cm, with bright green, much indented leaves that create a lacy shape. The small flowers are mid pink rouged with bright ruby on the upper petals, and are borne in terminal umbels. The seed head somewhat resembles that of a stork’s head. Some forms of scented geranium are suited to cultivation in well drained pots placed in a sunny position. I have mine planted in a garden bed, reserved for all my fynbos (fine bush). They are drought resistant and can be propagated by taking cuttings of stems 10cm in length and inserting them into a sterilized mix. They need to be protected from frost and regular harvesting restricts the size of the larger specimens. They should be lightly fertilized in spring and watered thoroughly when the soil dries out. Harvest and dry the leaves at any time and use the dried leaves of the rose or lemon varieties to make tea. Finely chop fresh leaves and infuse them in a warm liquid such as milk; strain and use the liquid for ice cream etc. Infuse red wine vinegar with rose geranium and fresh raspberries and strain after a week for use as a salad dressing. Cool your cake on top of the leaves to infuse the flavour into the cake. Line a jelly mould with the leaves before pouring your jelly into the mould. That would make interesting flavours in a dish.. What can I do with all my pumpkin flowers!! I have seen pumpkin flowers being used for salads, just blanch them and use them as is – never tried it though! I love rose-scented geraniums too – the tea is so wonderfully calming and relaxing. That’s one thing I never use in cooking, but I should. Flowers make salads look so pretty! You should have a lot of edible flowers where you live – I have the best heather flower mix that we bought back from Scotland – the purple heather is the prettiest by far! I absolutely love my geraniums! They are such a hardy plant aren’t they Liz? Love the jelly mould idea – how beautiful. I cannot wait to try it Sally! I love the idea of cooling a cake on the leaves to infuse the flavor. This is one of my favourite aromoatherapy oils – will have to use it in my cooking now too! I also love the essential oil! Tandy, these geraniums are gorgeous! I had no idea you can use them for cooking. Thanks for sharing! Ooo, I also want a scented germanium in my garden – what a fabulously useful plant.